Essel World is a popular theme park in India, which is located in Mumbai. To buy theme park tickets, you should need to visit the official website. An advance reservation is one of the best ways to save your time and more concentrate on fun. Essel World is one of the best theme parks in India, a countrywide popular place for fun with your family. So, let’s see our tips and guide on how to reach EsselWorld. Essel World is mostly visited by Mumbaikars on weekends. It is also considered as the most popular weekend place for local people. You have to use Western Express Highway to reach EsselWorld from Mumbai. On the express highway, turn left to Kashimira and drive down towards to Mira-Bhayander road. EsselWorld has put signages which will guide you to reach there. It takes about 35-45 minutes from Kashimira. If you don’t own a car then MBBT bus is the best way to reach here. Take MBBT Bus No. 4 from Bhayander bus depot. which will drop you directly at Essel World Amusement Park. Taxi and Auto Rickshaws are also there but it will be little costly, if cost is the matter. If we consider Mumbai central as the point then distance between essel world and Mumbai central is 58.4 kms. It requires 1.40 hours (approx.) of car driving. EsselWorld is also most visited by Gujarati people due to location benefit. You have to use National Highway No. 8 till fountain junction. After that, turn right towards Kashimira and drive down towards Mira-Bhayander road. After that, EsselWorld sign boards will guide you to reach there. Train is the most cheapest way to reach here. You have to use Western Railways train from railway station of Malad. If you have taken train from Malad (W), from then take BEST Bus no. 272 to reach Marve-Malad. Taking auto rickshaw from Malad(W) is another option to reach Marve-Malad. Now, Marve-Malad is the bus termination point where you can avail ferry services of EsselWorld to reach here. EsselWorld’s own ferries are available every 45 minutes from Marve-Malad. They charge additional fees for this service. Malad to Essel World distance is 32 kms which is little to enjoy the day. Take a train from anywhere in the city to reach Borivali railway station. From there, take a BEST Bus No. 294 to reach Gorai-Borivali. You can also hire auto rickshaw or taxi to reach Gorai – Borivali, it is little costly. It is recommended to use only BEST Bus service for budget travelers. From Gorai-Borivali, you can use ferry service of Essel World to reach there. This ferry service is available every 15 minutes from Gorai-Borivali. 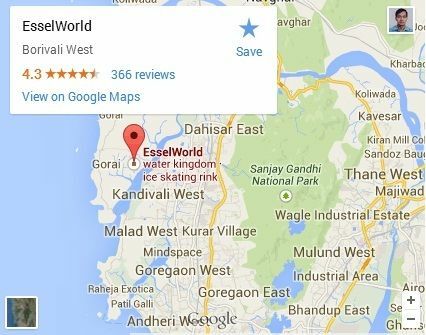 Borivali to Essel World distance is just 25.4 km (approx.) which requires 60 minutes of driving by car. Thane is also nearest city which draws visitors for EsselWorld. Distance between Thane to EsselWorld is approx. 38 km. You have to use train from Thane to Dadar. From then, use Wester Railways train to reach Malad or Borivali from Dadar. From Malada (W), use BEST bus service to reach Marve Beach. From Borivali, use BEST bus service to reach Gorai Creek. From both places, you can use ferry service of the park. If you are looking for travel guide from CBD Belapur, Mira Road, Pune, Gateway of India, Vasai, Vikhroli and other areas of Mumbai sub-urban then please refer Google Maps. It will provide you detailed guide how to reach EsselWorld from these areas. A few travel operators in Mumbai offers special travel packages for EsselWorld, which includes entry fees, lunch, breakfast, Mumbai Darshan, and pickup from popular locations. To buy travel packages for this trip, then please contact tour operators in Mumbai. Article last re-published on August 30, 2018. I think Essel World is one of the most popular travel places in Mumbai and we should also considered it as one of the most popular weekend getaways from Mumbai. So, your guide on how to reach Essel World would be really useful.